Search for all "CD207 / Langerin"
Mouse anti Human, Mouse CD207 / Langerin 808E10.01. 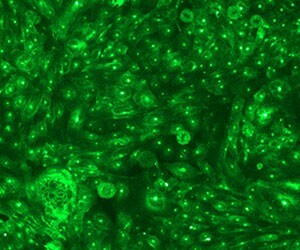 Product is tested for Immunocytochemistry/Immunofluorescence. Langerin/CD207 is a transmembrane C-type lectin receptor (CLR) of epidermal and mucosal Langerhans cells (LCs) that induces Birbeck granule formation. Langerin features a single carbohydrate recognition domain (CRD) with mannose-type specificity in its extracellular portion. Langerin is unique among the CLRs in that it contains an intracellular domain with a proline-rich motif. Langerin expression has not been reported outside the DC system. (Valladeau J et al, 2002; J. Immunol., 168 : 782-779 ; Douillard P et al, 200; J. Invest. Dermatol., 125: 983–994). 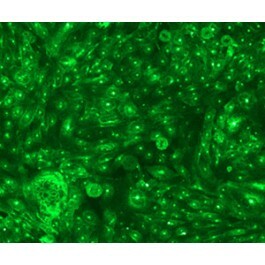 Mock- and Langerin-transfected CHO cells are incubated with biotin-labelled gp160 (5μg/ml) and clone 808E10.01 at (1 to10μg/ml) in PBS 45 min. at RT. Cells were washed in PBS 5min at 1600rpm, and stained with Streptavidin-PE 30 min at 4°C (DAKO). A last PBS wash is performed before Flow cytometry analysis. Valladeau J, Clair-Moninot V, Dezutter-Dambuyant C, Pin JJ, Kissenpfennig A, Mattéi MG, et al. Identification of mouse langerin/CD207 in Langerhans cells and some dendritic cells of lymphoid tissues. J Immunol. 2002 Jan 15;168(2):782-92. PubMed PMID: 11777972. Douillard P, Stoitzner P, Tripp CH, Clair-Moninot V, Aït-Yahia S, McLellan AD, et al. Mouse lymphoid tissue contains distinct subsets of langerin/CD207 dendritic cells, only one of which represents epidermal-derived Langerhans cells. J Invest Dermatol. 2005 Nov;125(5):983-94. PubMed PMID: 16297200. Nfon CK, Dawson H, Toka FN, Golde WT. Langerhans cells in porcine skin. Vet Immunol Immunopathol. 2008 Dec 15;126(3-4):236-47. doi: 10.1016/j.vetimm.2008.07.012. Epub 2008 Aug 3. PubMed PMID: 18805593.
de Jong MA, de Witte L, Taylor ME, Geijtenbeek TB. Herpes simplex virus type 2 enhances HIV-1 susceptibility by affecting Langerhans cell function. J Immunol. 2010 Aug 1;185(3):1633-41. doi: 10.4049/jimmunol.0904137. Epub 2010 Jun 30. PubMed PMID: 20592277. Rochereau N, Verrier B, Pin JJ, Genin C, Paul S. Phenotypic localization of distinct DC subsets in mouse Peyer Patch. Vaccine. 2011 May 9;29(20):3655-61. doi: 10.1016/j.vaccine.2011.03.012. Epub 2011 Mar 23. PubMed PMID: 21439318. Schwingshackl P, Obermoser G, Nguyen VA, Fritsch P, Sepp N, Romani N. Distribution and maturation of skin dendritic cell subsets in two forms of cutaneous T-cell lymphoma: mycosis fungoides and Sézary syndrome. Acta Derm Venereol. 2012 May;92(3):269-75. doi: 10.2340/00015555-1220. PubMed PMID: 22678564. Luckashenak N, Wähe A, Breit K, Brakebusch C, Brocker T. Rho-family GTPase Cdc42 controls migration of Langerhans cells in vivo. J Immunol. 2013 Jan 1;190(1):27-35. doi: 10.4049/jimmunol.1201082. Epub 2012 Dec 3. PubMed PMID: 23209325. Debeer S, Le Luduec JB, Kaiserlian D, Laurent P, Nicolas JF, Dubois B, et al. Comparative histology and immunohistochemistry of porcine versus human skin. Eur J Dermatol. 2013 Jul-Aug;23(4):456-66. doi: 10.1684/ejd.2013.2060. PubMed PMID: 24047577.